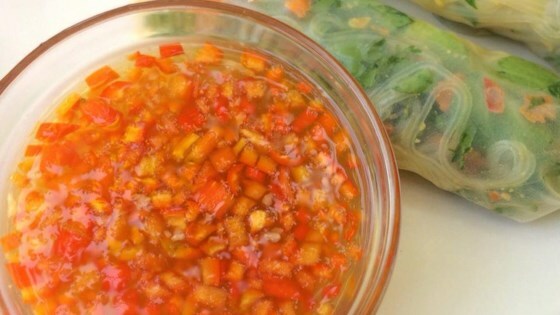 "This sauce can be used for dipping veggies, meats, or egg rolls. It's also great spooned over a bowl of steaming hot pho or other rice noodle soup. For me this sauce IS the flavor of Vietnamese cooking. Enjoy! This can be stored in the fridge for up to two weeks." Stir water, chile peppers, garlic, fish sauce, rice vinegar, and sugar together in a saucepan over medium-low heat until sugar dissolves into the liquid; remove from heat and set aside to cool completely, about 1 hour. Stir lemon juice into the cooled liquid. Absolutely delicious! A versatile, ubber yummy sauce! So good I'd eat it off a dirty flip-flop on a dare.